You probably already know the import of having a squeaky clean email list as ISPs, email protection software, and spam filters maintain a threshold for spam reports, unsubscribe requests and bounce rate. If these thresholds are exceeded, your email may be blocked let alone your campaign. And not cleaning your email lists regularly can lead to such horrible circumstances. What do we really mean by cleaning a list? No, you do not need to wash your list (pun intended!). Cleaning a list can simply mean verifying email address and getting rid of invalid or stale email addresses. You can do it yourself or have a company do it for you. In both the cases, the result does not ensure 100% clean lists. In fact, no list can ever be fully clean. The problematic email addresses should be kept minimal and that is only possible through cleaning the lists. It is estimated that you can lose up to one-third of your list every year because of address changes, bounces and unsubscribe requests. To maintain the integrity of your list as well as its strength, you actively need to clean it and add more active subscriber email addresses. Before removing an email address, send them an email asking them if they still want to stay subscribed to your email list. This has to be super polite of course. There is a very real chance that the user may begin to rethink their decision to opt-out from receiving your marketing emails. This email, however, should be more about the user than about you. If you are able to make them see their own benefit, maybe they will change their mind. This is a nice way to confirm that the email is still active. Use a special offer or some discount coupon code to entice the subscriber to make a purchase or reply back in some form. This will confirm that their email is still active and they still want to keep hearing from you. When you ask your inactive users to unsubscribe, give them a one-page simple form to collect information about why they have been inactive. Put suggestive reasons like too many emails, fewer discounts or no accurate information. This will help you in keeping your other subscribers interested. You can even use the same form on the unsubscribing confirmation page. You should send out emails at least once a month to your list. This will not only help you find out which emails are inactive through bounce backs but will also help you keep your subscribers engaged. This also increases the chances of the user buying your product or service. You need to learn from the response and reports of your previous emails. Analyzing the results from these reports (clicks rates, open rates etc), you need to segment your list based on purchases or preferences of the users. This is important because it will help you narrow down the preferences and liking of your audience and use that to your advantage. 58% of all revenue comes from segmented and targeted emails. For instance, you sell accessories for women and a particular user has bought only watches from you. You can send her emails about watches. Create a sub list for people interested in your watches. Just because you purchased a big list once, does not mean you do not need any more subscribers. 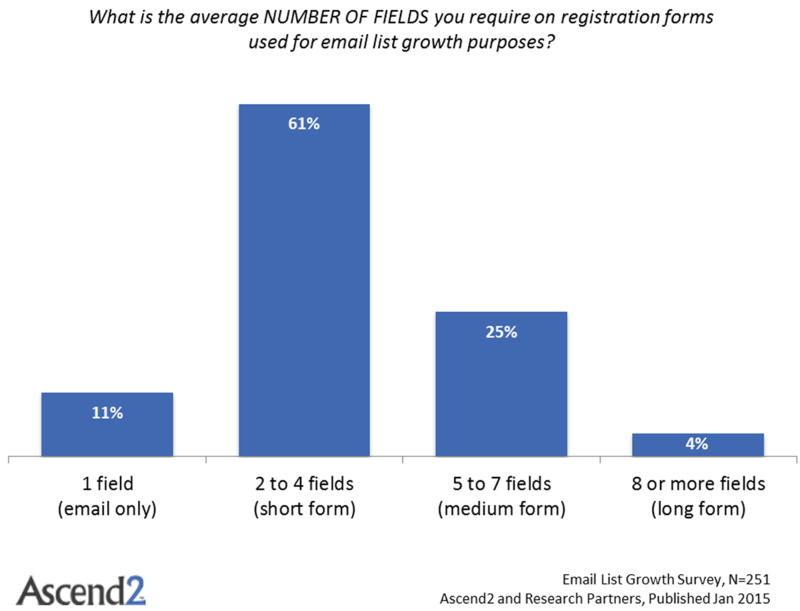 You need to actively grow your list and get new email addresses. You can use sign up forms to get more subscribers and add them to your current list. The stale or inactive email addresses should not only be removed but replaced with new ones. The following graph gives a guideline about the form used for registering users. There are online tools that use real-time APIs to scrub your email list. They find out which email addresses are inactive and also remove disposable email domains, generic emails or role-based emails and returns you a clean list with active and genuine users. This is another tactic to add more people to your list by using social media. Email is proven to be more effective at marketing than social media as it is 40 times more effective at gaining new customers than Facebook or Twitter. However, the power of social media should not be underestimated. It can serve as a great tool to get people to subscribe to your emails. Here is a detailed article about increasing your following. You can post some kind of competition and get people to sign up. Since Facebook is widely used (1.6 billion monthly active users), a lot of people will likely subscribe to take part in the contest and ultimately engage with you. According to Campaign Monitor, emails with personalized subject lines have 26% higher chances of getting opened by the recipient. When a customer has stopped opening your emails, a personalized email can be a way to get them back on board. Use the data from your analysis reports to cater to the subscriber’s wants. They will open the email and interact confirming their status as still active and now interested. Twitter, with its 310 million monthly active users, can serve as a great tool for cleaning your list and adding new active emails. Use Twitter Lead Generation Cards, which simply use a call to action on twitter and the user’s name, email, and twitter handle, gets automatically filled as they subscribed. This video will guide you about how to use these. These tips will improve your list and keep your active user numbers steady. Old lists that are not consistently cleaned and augmented can lead to big bounce rates and low click-through. It is imperative to keep adding new contacts to your list because email addresses get inactive or stale quite often than you may assume.